Isn’t butter chicken just the most wonderful sounding name for a recipe? 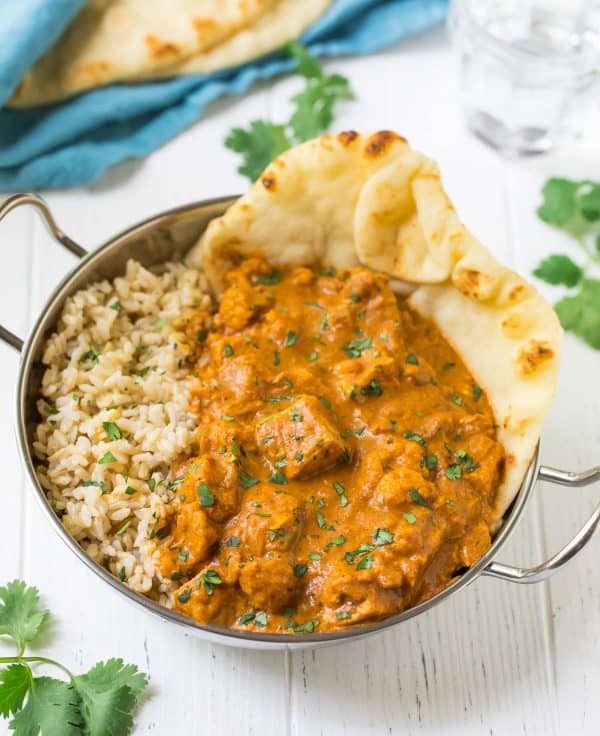 Today’s Instant Pot Butter Chicken has all of the comforting, soul-satisfying flavor any recipe with the word “butter” in it promises. 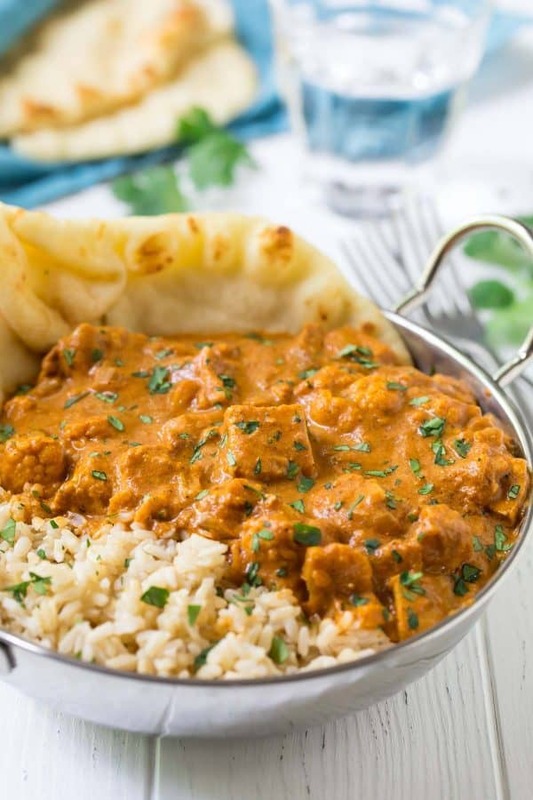 Unlike other authentic Indian butter chicken recipes you’ve seen, it’s also a butter chicken recipe that’s EASY, healthy, and made with ingredients you can find at any grocery store. I’ve even snuck in a full serving of veggies to make it a true one-pot meal! I have been smitten with Indian food ever since my post-college roommate and I spent a month traveling India after we graduated, especially the rich, saucy curries like authentic Indian butter chicken. I first made this easy spin on an authentic Indian butter chicken recipe to surprise my roomie/former India travel buddy when she came to visit us, it has since become one of my favorite weeknight dinners. With its simplicity to make, fab flavor, and ability to be enjoyed with one the best Indian foods around (naan bread! ), creamy butter chicken recipe is a perfect choice for casual dinners at home and for when you want to surprise friends with something fresh and different. If you aren’t familiar with butter chicken ingredients, imagine tender, falling-apart morsels of chicken in a creamy, mildly spiced curry sauce so delicious, you catch yourself running a finger along the edge of the bowl to make sure you don’t miss a drop. Butter chicken is not spicy in the sense of being “hot;” rather it is fully flavored with layers of Indian spices and ingredients like ginger, tomato, curry, and coconut milk. While we were in India, my roomie and I took a cooking class, where I quickly realized that part of the reason Indian food tastes so incredible is that it takes ALL DAY to make. There are whole spices to toast and grind, sauces to simmer, and bread to bake. The process is fun for an afternoon class while in India but impractical for day-to-day life at home, especially at 6:30 p.m. when the line between eating real food for dinner and eating chips + wine for dinner becomes alarmingly thin. I’ve been loving making Instant Pot recipes Indian, because the pressure cooker consolidates flavors in a way that mimics the effect of all-day stovetop cooking. This Instant Pot Chicken Tikka Masala and this Instant Pot Lentil Curry have become a favorites of both mine and of many of yours too, so I wanted to explore making more Instant Pot Indian recipes. 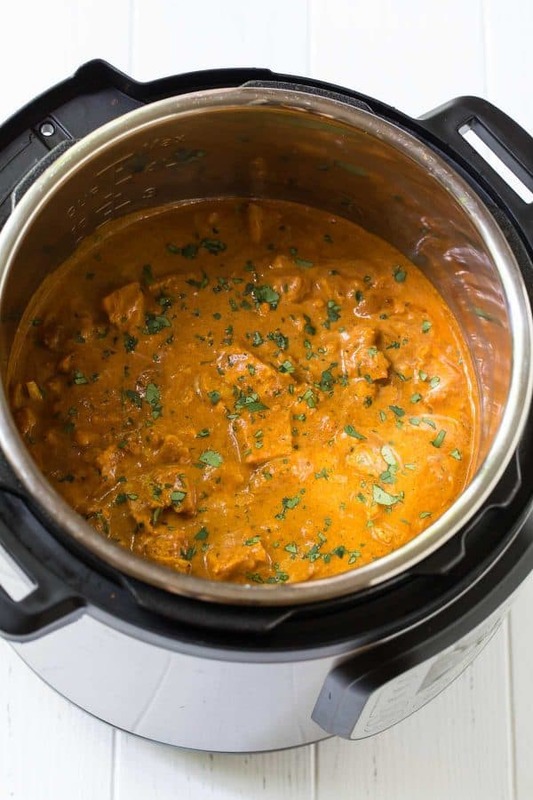 Thus, this Instant Pot Butter Chicken, while perhaps not the most authentic Indian butter chicken recipe in the land, will be one of the easiest butter chicken recipes you’ll find, starting with the ingredients. What’s in Butter Chicken Sauce? I made this Instant Butter Chicken with coconut milk (look for it in the Asian food section of your grocery store), tomato sauce, and two spice blends, curry powder and garam masala. My grocery store carries both blends, but if you can’t find them, Amazon has several options, and Trader Joe’s and Whole Foods sell them too. 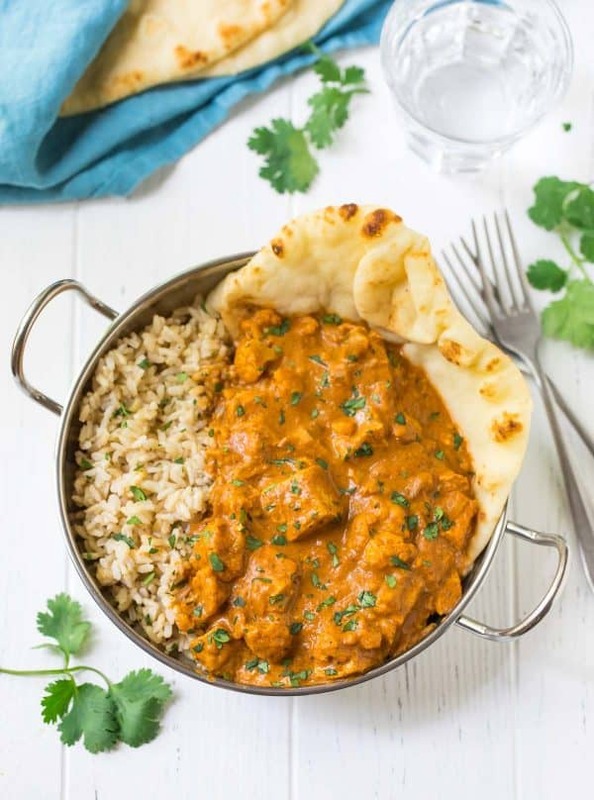 How Can I Make Easy Instant Pot Butter Chicken Healthy? In my usual style, this is also an healthy Instant pot recipe! I added cauliflower to the mix to make it half chicken/half veggie. I love the way the cauliflower breaks down and absorbs the butter sauce’s flavor. The cauliflower mimics the texture and appearance of the chicken too, so you almost don’t realize you are eating vegetables. Can I Make this a Vegetarian Instant Pot Recipe or a Vegan Instant Pot Recipe? Yes! You can try omitting the chicken and using all cauliflower or explore some of my other vegetarian Instant Pot recipes, such as this healthy Instant Pot Cauliflower Mac and Cheese. To make vegan, use full fat coconut milk in place of the half and half, a vegan buttery substitute for the butter, and an unsweetened coconut milk-based yogurt in place of the Greek yogurt. Can I Make this Butter Chicken with Frozen Chicken? Yes! You can use frozen chicken and even frozen cauliflower florets. Your Instant Pot will take longer to come to pressure before the cooking time begins, but the dish will still be delicious. Can I Make this Slow Cooker Butter Chicken Instead? While you can experiment, making this in the slow cooker will cause the recipe to be more liquidy. I would suggest cutting back on the amount of tomato sauce and only stir in the amount of coconut milk or half and half until you have a butter chicken sauce with your desired consistency. 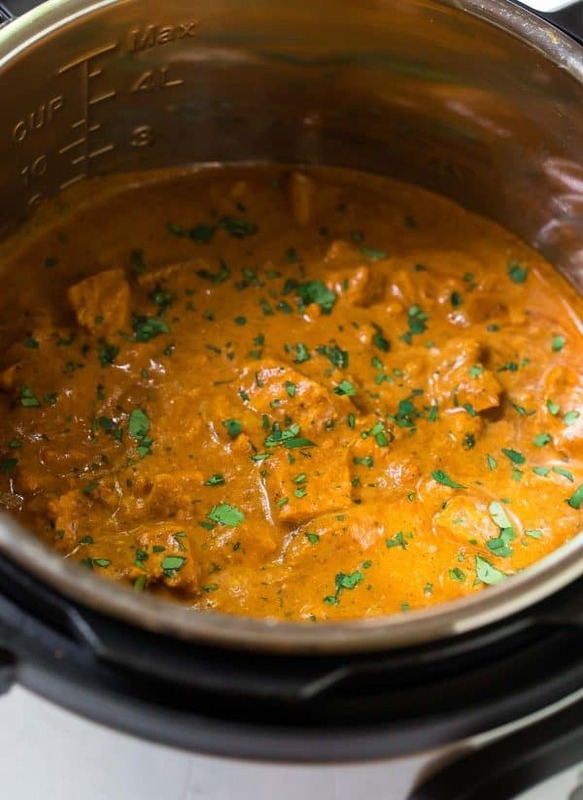 To make butter chicken in a slow cooker, step-by-step: Sauté the onions and spices in a skillet on the stove (instead of in the Instant Pot), then transfer to a slow cooker that is lightly coated with nonstick spray. Add the cauliflower, tomato sauce, and chicken, making sure the chicken is coated with the sauce. Cover and cook on high for 1 1/2 to 2 1/2 hours or low for 4 to 6 hours, until the chicken is cooked through. The cooking time may vary based on your slow cooker, so check early to ensure the chicken does not dry out. When the chicken is done, cut into bite-sized pieces, then return to the slow cooker and stir in with the half and half. Let cool a few minutes, then stir in the Greek yogurt. Can I Make this Butter Chicken on the Stovetop? Yes! I have not yet tested this but think this recipe could be made in a Dutch oven using the following steps. If you try it, I’d love to hear how it goes. Cut the chicken into bite-sized pieces. Heat 1 tablespoon of olive oil in a Dutch oven over medium high. Sauté until golden on all sides, about 5 minutes. Remove from the pan and set aside. Add additional 1 tablespoon olive oil. Sauté the onions and spices until the onion is softened. Stir in the tomato sauce, cauliflower, and sautéed chicken. Bring the sauce to a gentle simmer. Partially cover the pot then let cook, keeping the sauce at a gentle simmer, until the chicken is cooked through and the cauliflower is tender, about 15 minutes. Stir in the half and half. Let cool a few minutes, then stir in the Greek yogurt as directed. I hope this Instant Pot Butter Chicken inspires some fresh flavors and brings a taste of adventure to your kitchen. Even if you’ve never cooked (or eaten!) Indian food, I think you’ll be surprised and refreshed by the way something as simple trying a new recipe can transport you from the comfort of your own table. Instant Pot Butter Chicken. An easy, healthy recipe for Indian butter chicken made with easy to find ingredients. Delicious and not too spicy! Add the coconut oil to the Instant Pot and set to SAUTE. Once hot, add the onion and cook until beginning to soften, about 5 minutes. Add the ginger, garlic, curry, garam masala, chili powder, and salt. Cook until fragrant, about 30 seconds. Turn the Instant Pot to OFF. Add a splash or water or chicken broth and stir, using a sturdy plastic or wooden spoon to scrape loose any browned bits that have stuck. Make sure you remove all of the stuck on bits so that you don't trigger a burn warning. Add the tomato sauce and cauliflower florets and stir to combine. Lay the chicken breasts on top, then scatter the butter pieces over the top. Close and seal Instant Pot. Cook on Manual (HIGH) pressure for 12 minutes. Once the time is up, let the pressure release naturally for 10 minutes, then vent to immediately release any remaining pressure. Carefully open the lid and transfer the chicken to a cutting board. Cut into bite-sized pieces, then return to the sauce. Stir in the half and half or coconut milk. Let cool a few minutes, then stir in the Greek yogurt (do not stir it in immediately or it will curdle). Serve with rice and a sprinkle of fresh cilantro. Store leftovers in an airtight container in the refrigerator for up to 5 days or freeze for up to 3 months. Let thaw overnight in the refrigerator. Reheat leftovers gently on the stovetop or in the microwave.